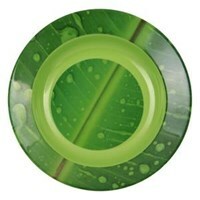 Concave Spot plate 9 inch Banana Leaf motif can complement your dinner table. This versatile dishes suitable for rice dishes everyday in the home or other side dishes. With teak leaf motif food becomes more interesting and memorable moments on serve.Concave Spot plate 9 inch Banana Leaf motifProduct DetailBrand: IfiancyMaterial: Food Grade MelamineMotif: Banana Leaf1 Box contents 168 PcsPurchase in increments of 1 BoxProduced by PT. Multi Anugrah SuccessMade in IndonesiaSpecifications (Per Item)Diameter: 23 cmHeight: 3.1 cmWeight: 152 gramsexcellenceStrongshineScratch resistantMatch Quality: ISO 9001: 2008, ISO 7322: 2008Heat Resistant: Made for usage at a temperature of -20C to + 120C.DeliveryThis product Ready StockShipping: 4-5 business days to JabodetabekThe delivery time above includes 3-day fulfillment time to process this stuffclaims ColorsDue to the many variations of the device and browser monitor, the colors displayed on your monitor will be different. By doing so, we can not guarantee the color you see or colors displayed on our website will look the same on all devices.We do our best effort to ensure the colors shown on our website is the same color as the actual product.Rule ReturnsReturn / Exchange for Defective Goods or FalseYou can make a return if the product Melamine received in damaged condition or disability. Customer Service Glori ready to serve the return of goods to be exchanged.Rule return / exchange for defective or wrong item is as follows:Customers can contact us on +6285212140010 cs to do onsite.Redemption will be made after the products of previous orders have been accepted by our customer service.Customers do not need to bear the shipping costs for exchange. Postage will be borne by Glorimelamine.com.We will process the exchange during 7 working daysWe will make delivery and confirm your new orders.Delivery errorIn the event of delivery errors, the first thing you should do is to report to our customer service immediately. Inform Order Number, your personal data, shipping errors that occurred, and the stuff you're supposed to get. This delivery errors will soon be overcome. 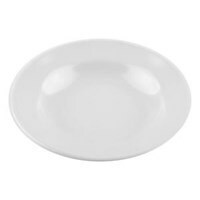 Concave 9 inch plate White Spot can complement your dinner table. 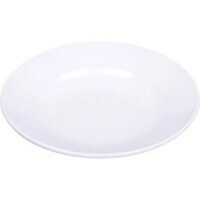 This versatile dishes suitable for rice dishes everyday in the home or other side dishes.Concave 9 inch plate White SpotProduct DetailBrand: Glori Melamine / IfiancyMaterial: Food Grade MelamineWhite color1 Box contents 144 PcsPurchase in increments of 1 BoxProduced by PT. Multi Anugrah SuccessMade in IndonesiaSpecifications (Per Item)Diameter: 23 cmHeight: 3.1 cmWeight: 186 gramsexcellenceStrongshineScratch resistantMatch Quality: ISO 9001: 2008, ISO 7322: 2008Heat Resistant: Made for usage at a temperature of -20C to + 120C.DeliveryThis product Ready StockShipping: 4-5 business days to JabodetabekThe delivery time above includes 3-day fulfillment time to process this stuffclaims ColorsDue to the many variations of the device and browser monitor, the colors displayed on your monitor will be different. By doing so, we can not guarantee the color you see or colors displayed on our website will look the same on all devices.We do our best effort to ensure the colors shown on our website is the same color as the actual product.Rule ReturnsReturn / Exchange for Defective Goods or FalseYou can make a return if the product Melamine received in damaged condition or disability. Customer Service Glori ready to serve the return of goods to be exchanged.Rule return / exchange for defective or wrong item is as follows:Customers can contact us on +6285212140010 cs to do onsite.Redemption will be made after the products of previous orders have been accepted by our customer service.Customers do not need to bear the shipping costs for exchange. Postage will be borne by Glorimelamine.com.We will process the exchange during 7 working daysWe will make delivery and confirm your new orders.Delivery errorIn the event of delivery errors, the first thing you should do is to report to our customer service immediately. Inform Order Number, your personal data, shipping errors that occurred, and the stuff you're supposed to get. This delivery errors will soon be overcome. Anda Mencari "Piring Makan Cekung"? 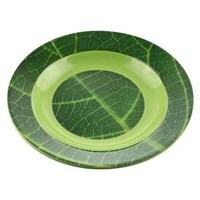 Buat Permintaan Untuk "Piring Makan Cekung"
Concave Spot plate 9 inch Teak Leaf motif can complement your dinner table. This versatile dishes suitable for rice dishes everyday in the home or other side dishes. With teak leaf motif food becomes more interesting and memorable moments on serve.Concave Spot plate Leaf motif Jati 9 inchProduct DetailBrand: IfiancyMaterial: Food Grade MelamineMotif: Teak Leaves1 Box contents 168 PcsPurchase in increments of 1 BoxProduced by PT. Multi Anugrah SuccessMade in IndonesiaSpecifications (Per Item)Diameter: 23 cmHeight: 3.1 cmWeight: 152 gramsexcellenceStrongshineScratch resistantMatch Quality: ISO 9001: 2008, ISO 7322: 2008Heat Resistant: Made for usage at a temperature of -20C to + 120C.DeliveryThis product Ready StockShipping: 4-5 business days to JabodetabekThe delivery time above includes 3-day fulfillment time to process this stuffclaims ColorsDue to the many variations of the device and browser monitor, the colors displayed on your monitor will be different. By doing so, we can not guarantee the color you see or colors displayed on our website will look the same on all devices.We do our best effort to ensure the colors shown on our website is the same color as the actual product.Rule ReturnsReturn / Exchange for Defective Goods or FalseYou can make a return if the product Melamine received in damaged condition or disability. Customer Service Glori ready to serve the return of goods to be exchanged.Rule return / exchange for defective or wrong item is as follows:Customers can contact us on +6285212140010 cs to do onsite.Redemption will be made after the products of previous orders have been accepted by our customer service.Customers do not need to bear the shipping costs for exchange. Postage will be borne by Glorimelamine.com.We will process the exchange during 7 working daysWe will make delivery and confirm your new orders.Delivery errorIn the event of delivery errors, the first thing you should do is to report to our customer service immediately. Inform Order Number, your personal data, shipping errors that occurred, and the stuff you're supposed to get. This delivery errors will soon be overcome. 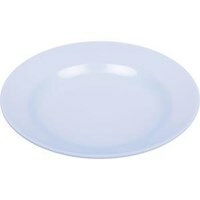 Concave 9 inch plate Spot Light Blue can complement your dinner table. This versatile dishes suitable for rice dishes everyday in the home or other side dishes.Concave 9 inch plate Spot Light BlueProduct DetailBrand: Glori Melamine / IfiancyMaterial: Food Grade MelamineColor: Light Blue1 Box contents 144 PcsPurchase in increments of 1 BoxProduced by PT. Multi Anugrah SuccessMade in IndonesiaSpecifications (Per Item)Diameter: 23 cmHeight: 3.1 cmWeight: 186 gramsexcellenceStrongshineScratch resistantMatch Quality: ISO 9001: 2008, ISO 7322: 2008Heat Resistant: Made for usage at a temperature of -20C to + 120C.DeliveryThis product Ready StockShipping: 4-5 business days to JabodetabekThe delivery time above includes 3-day fulfillment time to process this stuffclaims ColorsDue to the many variations of the device and browser monitor, the colors displayed on your monitor will be different. By doing so, we can not guarantee the color you see or colors displayed on our website will look the same on all devices.We do our best effort to ensure the colors shown on our website is the same color as the actual product.Rule ReturnsReturn / Exchange for Defective Goods or FalseYou can make a return if the product Melamine received in damaged condition or disability. Customer Service Glori ready to serve the return of goods to be exchanged.Rule return / exchange for defective or wrong item is as follows:Customers can contact us on +6285212140010 cs to do onsite.Redemption will be made after the products of previous orders have been accepted by our customer service.Customers do not need to bear the shipping costs for exchange. Postage will be borne by Glorimelamine.com.We will process the exchange during 7 working daysWe will make delivery and confirm your new orders.Delivery errorIn the event of delivery errors, the first thing you should do is to report to our customer service immediately. Inform Order Number, your personal data, shipping errors that occurred, and the stuff you're supposed to get. This delivery errors will soon be overcome. 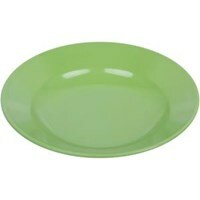 Concave 9 inch plate Green Spot can complement your dinner table. 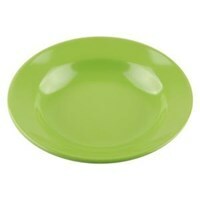 This versatile dishes suitable for rice dishes everyday in the home or other side dishes.Concave 9 inch plate Eating GreenProduct DetailBrand: Glori Melamine / IfiancyMaterial: Food Grade MelamineGreen color1 Box contents 144 PcsPurchase in increments of 1 BoxProduced by PT. Multi Anugrah SuccessMade in IndonesiaSpecifications (Per Item)Diameter: 23 cmHeight: 3.1 cmWeight: 186 gramsexcellenceStrongshineScratch resistantMatch Quality: ISO 9001: 2008, ISO 7322: 2008Heat Resistant: Made for usage at a temperature of -20C to + 120C.DeliveryThis product Ready StockShipping: 4-5 business days to JabodetabekThe delivery time above includes 3-day fulfillment time to process this stuffclaims ColorsDue to the many variations of the device and browser monitor, the colors displayed on your monitor will be different. By doing so, we can not guarantee the color you see or colors displayed on our website will look the same on all devices.We do our best effort to ensure the colors shown on our website is the same color as the actual product.Rule ReturnsReturn / Exchange for Defective Goods or FalseYou can make a return if the product Melamine received in damaged condition or disability. Customer Service Glori ready to serve the return of goods to be exchanged.Rule return / exchange for defective or wrong item is as follows:Customers can contact us on +6285212140010 cs to do onsite.Redemption will be made after the products of previous orders have been accepted by our customer service.Customers do not need to bear the shipping costs for exchange. Postage will be borne by Glorimelamine.com.We will process the exchange during 7 working daysWe will make delivery and confirm your new orders.Delivery errorIn the event of delivery errors, the first thing you should do is to report to our customer service immediately. Inform Order Number, your personal data, shipping errors that occurred, and the stuff you're supposed to get. This delivery errors will soon be overcome. Concave 9 inch plate Eating Orange can complement your dinner table. 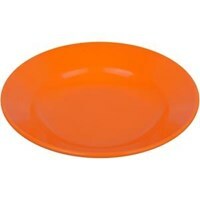 This versatile dishes suitable for rice dishes everyday in the home or other side dishes.Concave 9 inch plate Eating OrangeProduct DetailBrand: Glori Melamine / IfiancyMaterial: Food Grade MelamineOrange color1 Box contents 144 PcsPurchase in increments of 1 BoxProduced by PT. Multi Anugrah SuccessMade in IndonesiaSpecifications (Per Item)Diameter: 23 cmHeight: 3.1 cmWeight: 186 gramsexcellenceStrongshineScratch resistantMatch Quality: ISO 9001: 2008, ISO 7322: 2008Heat Resistant: Made for usage at a temperature of -20C to + 120C.DeliveryThis product Ready StockShipping: 4-5 business days to JabodetabekThe delivery time above includes 3-day fulfillment time to process this stuffclaims ColorsDue to the many variations of the device and browser monitor, the colors displayed on your monitor will be different. By doing so, we can not guarantee the color you see or colors displayed on our website will look the same on all devices.We do our best effort to ensure the colors shown on our website is the same color as the actual product.Rule ReturnsReturn / Exchange for Defective Goods or FalseYou can make a return if the product Melamine received in damaged condition or disability. Customer Service Glori ready to serve the return of goods to be exchanged.Rule return / exchange for defective or wrong item is as follows:Customers can contact us on +6285212140010 cs to do onsite.Redemption will be made after the products of previous orders have been accepted by our customer service.Customers do not need to bear the shipping costs for exchange. Postage will be borne by Glorimelamine.com.We will process the exchange during 7 working daysWe will make delivery and confirm your new orders.Delivery errorIn the event of delivery errors, the first thing you should do is to report to our customer service immediately. Inform Order Number, your personal data, shipping errors that occurred, and the stuff you're supposed to get. This delivery errors will soon be overcome.